INVITATION TO CRITICAL THINKING teaches you how to recognize, analyze, evaluate, and compose arguments that can be used as tools of rational persuasion. 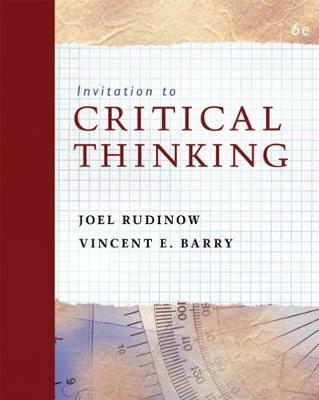 Fostering discussions of critical thinking and its application in mass media, effective writing, and problem solving, this book will introduce you to a wide variety of strategies for identifying and analyzing arguments in the world around you. In addition, the robust companion website offers an array of online tools that offer an unprecedented variety of interactive exercises that will not only help you remember important concepts, but apply them as well.